In July of 2012, the Synthetic Drug Abuse Prevention Act was passed. Among the substances that it outlawed were #2C-E and #2C-I, psychedelics based on a combination of MDMA and LSD. This presumptive test from Sirchie's NARK-II range tests a sample for six different 2-C substances at once. To use, simply place the sample inside the resealable bag, reseal, and then break the ampoules contained within. 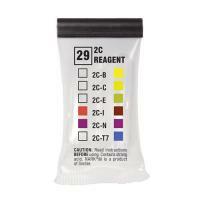 The reagent will change color if a 2-C substance is present, and a color comparison chart is printed on the front for ease of use. Its white background makes color changes easier to see.